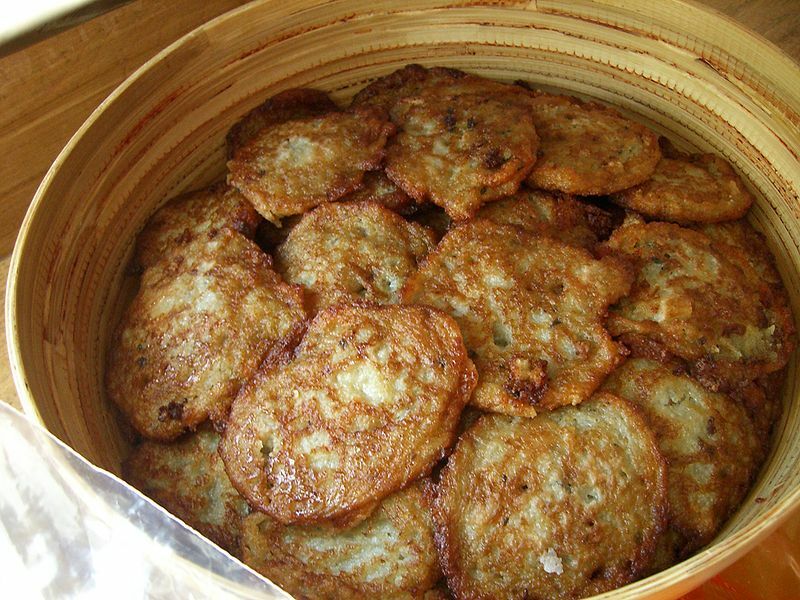 Potato pancakes, are shallow-fried pancakes of grated potato and egg, often flavored with grated onion. Potato pancakes may be topped with a variety of condiments, ranging from the savory (such as sour cream) to the sweet (such as applesauce or sugar), or they may be served ungarnished. Left: Deruny or draniki in a traditional crockery dish. Potato pancakes are sometimes made from mashed potatoes to produce pancake-shaped croquettes. Potato pancakes are commonly associated with traditional Austrian, German, Polish, Ukrainian, Yiddish (where they are known as latkes or latkas), Hungarian and Czech cuisines, although other cuisines (including those of India and Korea) also have similar potato pancakes. It is also the national dish of Belarus. In Ukrainian, Belarusian, and Russian cuisines potato pancakes are commonly known as deruny (Ukrainian: деруни) or draniki (Russian: драники, Belarusian: Дранікі). Left: Ukrainian-style deruny served with sour cream. 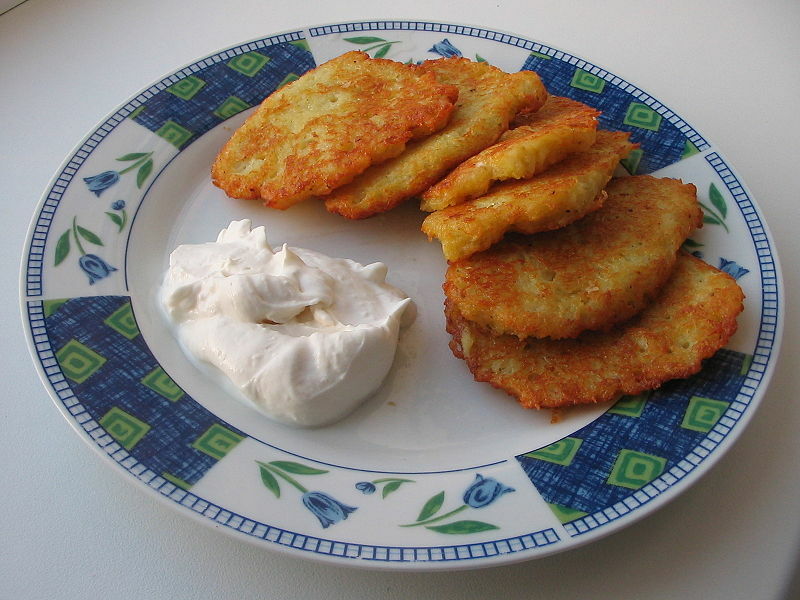 Throughout Germany, potato pancakes are also very much liked, most commonly under the names Reibekuchen or Kartoffelpuffer, and they are eaten either salty as a side dish or sweet with apple sauce and cinnamon; they are a very typical menu item during outdoor markets and festivals in the colder seasons. A form of potato pancake known as 'Boxty' is a popular traditional dish in most of Ireland. It is made in a similar way but using more starch. In North America and the U.K., a common variety of potato pancakes is called hash browns. In Switzerland, a potato cake called rösti is consider a national dish.